“This magnificent love letter to Rome” (Stephen Greenblatt) tells the story of the Eternal City through pivotal moments that defined its history—from the early Roman Republic through the Renaissance and the Reformation to the German occupation in World War Two—“an erudite history that reads like a page-turner” (Maria Semple). Rome, the Eternal City. It is a hugely popular tourist destination with a rich history, famed for such sites as the Colosseum, the Forum, the Pantheon, St. Peter’s, and the Vatican. In no other city is history as present as it is in Rome. Today visitors can stand on bridges that Julius Caesar and Cicero crossed; walk around temples in the footsteps of emperors; visit churches from the earliest days of Christianity. This is all the more remarkable considering what the city has endured over the centuries. It has been ravaged by fires, floods, earthquakes, and—most of all—by roving armies. These have invaded repeatedly, from ancient times to as recently as 1943. Many times Romans have shrugged off catastrophe and remade their city anew. 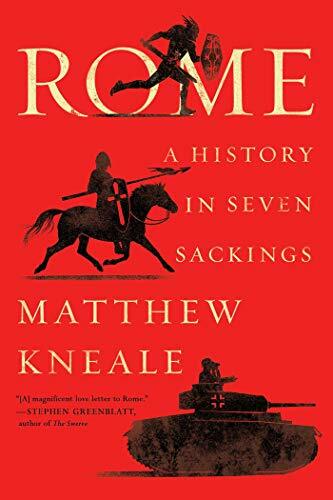 “Matthew Kneale [is] one step ahead of most other Roman chroniclers” (The New York Times Book Review). He paints portraits of the city before seven pivotal assaults, describing what it looked like, felt like, smelled like and how Romans, both rich and poor, lived their everyday lives. He shows how the attacks transformed Rome—sometimes for the better. With drama and humor he brings to life the city of Augustus, of Michelangelo and Bernini, of Garibaldi and Mussolini, and of popes both saintly and very worldly. Rome is “exciting…gripping…a slow roller-coaster ride through the fortunes of a place deeply entangled in its past” (The Wall Street Journal).